Check out the full article at the Red Letter Dodge website! Last month, our friends at Landmark Dodge and SpeedFactory came all the way from Georgia to hang out with the LX enthusiasts at Spring Fest 6 event in Irvine, California. In their display was their newest weapon of mass destruction to come out their Atlanta arsenal of modified late-model muscle cars. The 2010 Challenger SF500 (‘500’ designates either the horsepower or torque output of the specific model) SpeedFactory’s “entry level” model for customer’s looking to venture into the Supercharged dimension of boost and all the greatness it offers under one’s right foot. 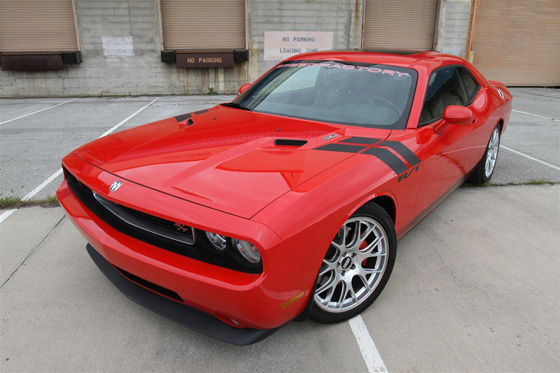 If 500 horsepower 5.7L HEMI® is considered entry level, then sign us up. Here their proven formula for success continues by offering enthusiasts fully warranty turn-key super cars. The team at Speed Factory doesn’t get sideways by tacking on aftermarket body kits that add extra pounds and drives up the cost of the vehicle. Instead their focus is on power train and suspension enhancements that will shock and awe their owners with a double barrel shot of adrenaline aimed straight at their brain. The SF500 begins its transformation to a giant killer once it arrives at the dealership. The engine is basically left stock as to keep the sticker price down and not impact the factory warranty. The Vortech Centrifugal Supercharger is the primary power adder that takes the stock 5.7L from 372 horses to over 500. The magic is in the specially calibrated tune that Vortech engineers and SpeedFactory have collaborated on. What’s just as sweet, the package is CARB approved and certified so it’s compliant in all 50 states and carries a 3 year/36,000 mile warranty through SpeedFactory.